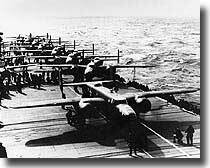 Ahoy - Mac's Web Log - Lieutenant Colonel Jimmie Doolittle's B-25 Raid on Japan. 18th. of April 1942. Lieutenant Colonel Jimmie Doolittle's B-25 Raid on Japan. 18th. of April 1942. The suprise and humilitating attack by the Japanese on Pearl Harbor on the 7th. of December in 1941, had left its mark on the American phyche and public morale was at a low ebb. To at least make a token strike back at the Japanese Homeland, President Franklin D. Roosevelt authorised a dangerous mission by a B-25 bomber raid against Tokyo and industrial targets in Japan. The plan to use B-25 Army bombers. The vast distance between US bases and the Japanese Homeland precluded the normal use of heavy bombers. 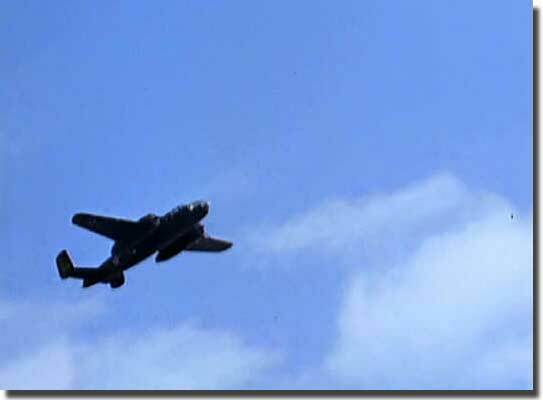 But, a daring plan to fly B-25 Army bombers from the flight deck of a US Navy carrier was hatched when on the 2nd. 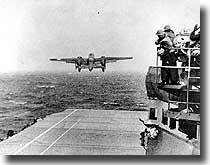 of February 1942, two B-25’s were successfully flown from USS Hornet, off Norfolk, Virginia. In late February 1942, this carrier transited the Panama Canal from the Atlantic Ocean into the Pacific to join the US Pacific Fleet. On the 1st. of April, 16 B-25 bombers were hoisted aboard Hornet, and the next day, her Captain, Marc A. Mitscher announced over his ship’s loud speaker system, that the ship and her Task Force would carry Lieutenant Jimmie Doolittle’s 16 B-25 bombers and their crews across the Pacific to place them within flying distance and about 400 miles from Japan, then launch this strike force, and withdraw the Task Force at high speed. USS Enterprise joins the Task Force. On the 13th. of April, USS Enterprise and her screening ships joined Hornet. In all, this Task Force 16, was made up of the two carriers, four cruisers, Vincennes, Nashville, Northampton and Salt Lake City, eight destroyers and two tankers. It is interesting that the heavy cruiser Vincennes was present and was also sunk at the Battle of Savo Island, and the destroyers Monssen and Ellet, were also at Savo, the latter destroyer had finally sank my ship HMAS Canberra, which had been set on fire and abandoned in the early hours of the 9th, of August 1942. The US submarines Thresher and Trout were operating off the Japanese coast to watch for enemy ships and to report upon weather conditions. The 18th. of April dawns. A storm blew up on the morning of the 18th. 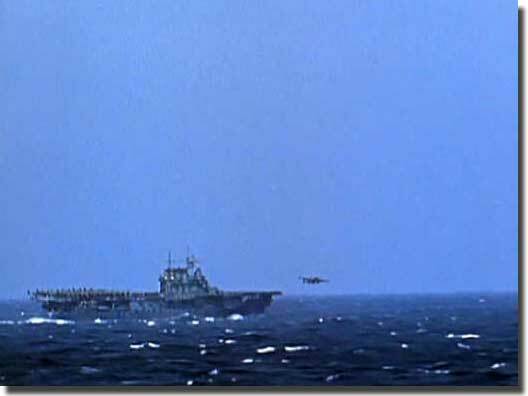 of April, the destroyers and the two tankers could not keep up, and dropped behind the carriers and four cruisers, to rejoin them after the B-25’s were launched, and the task force was withdrawing. At 0210 ( 2.10AM ) the radar picked up a contact, most likely two enemy ships ahead, and the force altered course to avoid them. A combat air patrol was launched at 0500 ( 5 AM ) and soon reported a Japanese picket 42 miles ahead, and at 0600 ( 6 AM ) a third vessel was in sight visually from Hornet, the cruisers and dive bombers successfully attacked them, but it seemed likely the position of the force was reported and any suprise compromised. Although 550 miles from Japan, and about 150 miles further out from the planned launch position, it had been the intention to fly off the bombers on the afternoon of the 19th. of April, so that they could drop their bomb load at night, it was decided to launch them now. At 0700 ( 7 AM ) the call came "Army pilots man your planes!" The first bomber, piloted by the leader, Lieutenant Colonel Jimmie Doolittle, thundered down the flight deck of Hornet at 0824 ( 8.24 AM ) and staggered into the sky, enroute for Tokyo. By 0920 ( 9.20 AM ) all the bombers had flown off Hornet, the only hitch, a flight deck crewman lost an arm, having been struck by a bomber’s propellor. It so happened that Tokyo had been on an air raid alert, a mock air raid had been carried out by Japanese aircraft, and the actual B-25 raid followed so closely, that it was really all over before the Japanese began to realise that they were under an attack from an enemy air raid. The actual damage caused was minimal, certainly when measured against later bomber raids made during WW2, but it non the less gave the Japanese hierarchy, a severe headache when trying to explain to its people how such an attack could come to pass. The raid however provided a great boost to both United States and Allied morale. Fate of the Bomber crews. None of the bomber crews came down in Japan, one landed in Russian territory and the other 15 aircraft crash landed in China or their crews bailed out. Of the 80 pilots and crew involved in this hazardous mission, 71 survived, one crew member died on bailing out, two were killed on crash landing, five were interned in Russia, and eight were captured by the Japanese. Of these, three were executed in Shanghai in October 1942, one died as a Prisoner of War, and the remaining four survived to be released at the end of WW2. Of the survivors from this daring raid, twelve lost their lives later in the war. Admiral Bull Halsey reversed the course of his ships, collected the destroyers and two tankers, and hightailed it to safety from enemy waters at high speed. 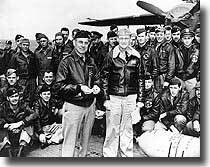 Jimmy Doolittle and his crews. 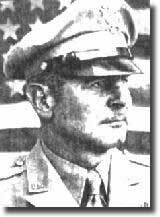 Lieutenant Colonel Jimmie Doolittle was soon promoted to Brigadier General, and awarded the Medal of Honor, and twenty three of his crewmen were awarded the Distinguished Flying Cross, how these were selected from the total number involved is a mystery. 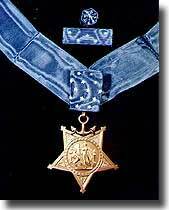 One would have thought that all who took part in this mission might well have been treated alike, and all would, in my view, have earned a Distinguished Flying Cross. This daring raid, boldly planned and executed, although it did little material damage to Japanese cities, it became difficult for the Japanese high command to explain away, but it provided a great morale boost for the people of America, and her Allies, at a time when very little was running in their favour. 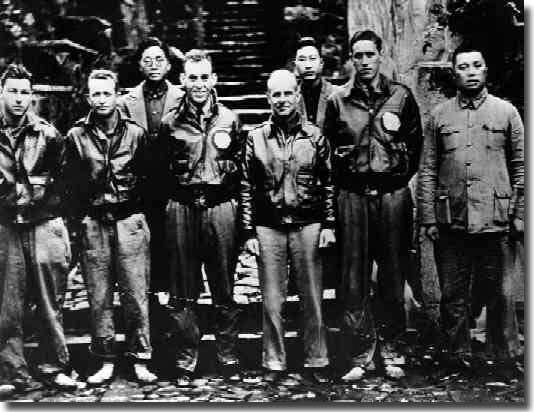 Lieutenant Colonel James H.Doolittle USAAF, centre with memebers of his flight crew and Chinese officials in China after the 18th. of April attack on Japan. Left to right. Staff Sergeant Fred A. Braemer, Bombardier, Staff Sergeant Paul J. leonard, Flight Engineer/Gunner, General Ho, Director of the Branch Government of Western Chekiang province, Lieutenant Richrad E. Cole, Copilot, Lieutenant Colonel Doolittle, Pilot and mission commander, Henry H. Shen, bank manager, Lieutenant Henry A. Potter, Navigator, Chao Foo Ki, secretary of the Western Chekiang province Branch Government. I hope this message finds you and all of your's healthy, wealthy and wise. All my best greetings in this post Christmas Season.